This manual provides practical and accessible information on all aspects of general nephrology, dialysis, and transplantation. It outlines current therapies in straightforward language to help readers understand the treatment rationale, and does not assume extensive knowledge of anatomy, biochemistry, or pathophysiology. 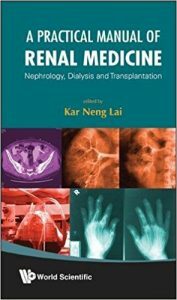 Consisting of 33 chapters written by 31 experts from four continents, this volume covers all the practical tips in the emergency and long-term management of patients with electrolyte disturbance, acid-base disturbance, acute renal failure, common glomerular diseases, hypertension, pregnancy-related renal disorders, chronic renal failure, and renal replacement therapy. It is thus an essential source of quick reference for nephrologists, internists, renal fellows, and renal nursing specialists, and is also suitable for graduate students and research scientists in the field of kidney diseases.